Welcome back to Monday Motivation! Can you believe we are on month FIVE with the Jacquelynne Staves Maggie's First Dance BOM? It has been a fantastic learning experience for me with the thread painting of blocks using Aurifil thread for blocks one through four! To see more of my thread painted blocks visit one, two, three and four. This month is the setting blocks! I wanted for my setting blocks to be background so my main thread painted blocks will POP! For the setting blocks, I used Denyse Schmidt Katie Jump Rope and pieced using Aurifil thread. To make the process faster, I chain pieced them! Chain piecing works better if your bobbin has thread! I am looking forward to next month when we finish up the quilt top! 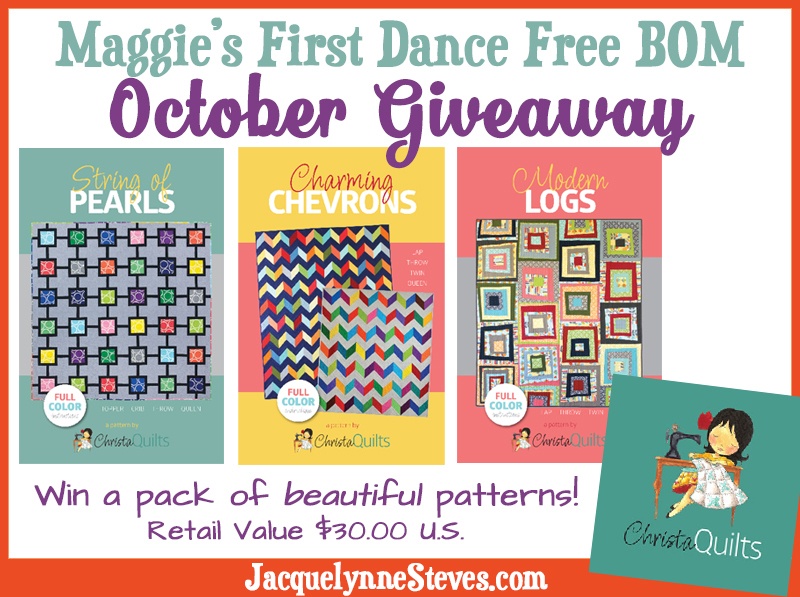 You can still participate in the Maggie's First Dance by visiting JacquelynneSteves.com . The October giveaway is sponsored by Christa Quilts! This giveaway is open internationally! The giveaway is open until 10 October and a random winner will be chosen and contacted on or about 12 October. If you are a no reply blogger, please leave your contact information in your comment. To enter for your chance to win this prize is easy! Leave a comment on what the weather is like where you live! It is really starting to feel like Autumn here in VA! I live in Durango, Colorado and we are experiencing gorgeous fall weather. The leaves are turning and the sunny days are crisp. I enjoyed your blog site and look forward to reading your future posts. The quilts are all beautiful. Blog on! I Springfield, Missouri the morning is cool and sunny with a high today of 80°F. Last week was cooler and really felt like fall! Love your soft Autumn colors-very pretty! It's wonderful here in south Mississippi. Cool in the mornings, but warming up during the day. We even get a soft breeze now & then, which keeps the humidity low-relief! It is cool and foggy here this morning. Later this week is supposed to be near 80!!!!! LOL, I've done that way too many times, then I curse haha!! Your blocks are amazing. Here in Wisconsin it's cool in the mornings and when the sun does shine it's quite nice in the afternoons, with leaves in golden reds, yellows, oranges starting to fall. Just think of all the thread you saved! Don't you hate it when that happens? I am in New England (Massachusetts), and it has cooled off wonderfully. Cooler nights make sleeping a lot easier and in the daytime I have more energy. We have been have gorgeous fall weather in Montana but today it is dark, cloudy and cool. I live in the UK and it's just beginning to get autumnal here. It's been a lovely sunny day today but the mornings are becoming chilly. Need to get my sweaters out! In southeast Kansas it is beautiful outside, cool but not too cool, just right! And sunny! thanks. For south TX, the humidity is a little lower which makes the temperature much more tolerable, Looking forward to lows in the low 60s later this week! Almost time to sleep with the windows open! Well, I live in Texas where we are feeling the tail end of summer with some moderate temperatures. But I am currently in California on the north coast where we are enjoying scattered rain & sunshine. cold weather in the winter, although some years I wonder if winter will ever leave. Today is an overcast fall day, 16 degrees, but it is suppose to warm up the rest of the week with warm days and cool nights. It was COLD this morning. Not my cup of tea for sure! It has been quite chilly here in CT. Fall is definitely in the air! The leaves are just beginning to change color here in mid-Michigan and it is 69 degrees! I live in Northwest Minnesota, on the prairie. We are having a gorgeous day today - in the high 60's and the most deep blue sky. Early this morning, on y way to a medical procedure, I saw the most incredible rainbow!! Weather man is forecasting our first frost on Friday. It is definitely feeling fall-ish here in NE Iowa. The leaves are starting to change colors and the temps have dropped almost to the point that I want to turn on the furnace. We won't do it yet though! I noticed your sewing machine is outside...do you sew out there sometimes? Central California weather is all over the place. Cloudy and cool today but will return to low 80s later in the week. Wishing our fall weather would be permanent. I am at the lake near Hayward, WI. We are blessed with clear, dry weather in the 60's. Fall colors are beginning to dot the landscape. Truly a delight on a sunny day! On beautiful Vancouver Island Bc Canada, it is overcast and 14 C. Quite a lovely day for a walk. Here in Lansing MI it has been a little cooler and rainy for the past few days. We had a bit of sunshine today and it is supposed to get a little warmer again. Not looking forward to the cold winter weather! In west central MN it is unusually warm - 65 at 8PM is pretty nice for this neck of the woods! In my humble opinion, it can stay this way until next April! Here in south Louisiana we have had a small amount of cool weather that has been nice, lows in the upper 60s and highs in mid 80s. I live in Plano, Texas, and its beginning to feel like fall. Crisp cool breezes in the early mornings, warm shirt-sleeved afternoons! Hi, your blocks are wonderful, love your choice of fabric ! It is still warm here in Surprise, AZ. It was 101 today. Thank you for all the fun !! I live in Mahomet.IL and we have had some nice fall weather the last couple of days. Your blocks are just beautiful. The weather here in sunny South Carolina is wonderfully warm & dry. Probably won't feel like autumn for a few more weeks. I am from Alexandria Ontario Canada, It was a warm day 15'(59'F)but nights have cooled down,so windows are mostly closed. It's definitely autumn here in Minnesota. Still some days in the 70's, but needing a jacket the other days. Thanks for the giveaway. I just discovered your blog yesterday and started to follow you. Thanks! Hi, I am registering for the giveaway. I live in Northern Virginia outside of Washington DC and the leaves have started to change color here. This morning, the temps are in the mid-50s. I like to take my morning walk before I settle down for many hours of sewing in the late morning and afternoon. I have recently retired after 31 years of working for the federal government and am devoting as much time as possible to quilting. It is beautiful fall weather here in Colorado, loving it! Weather has turned to fall here. Great that its not so hot all the time! weather is beautiful in Northern California. warm in the day and cool at night. It has been cloudy and rainy in Wisconsin. Starting to feel a lot like fall. Suppose to be real cool this weekend - lows in the 40s. Hi! Here in Roy, Utah it has been storming quite a bit. We 99% of the time don't get tornadoes, but we gave had 3 within about 6 weeks. The trees are all changing to there beautiful, red, orange and yellow color. What a beautiful time of year. I had to laugh at your missing bobbin thread, as I just did that on a quilt I finished this week. I only got about 20" missed, but had turned the quilt around and still didn't see that it was missing something. It's definitely fall here. We have the beautiful colors, a nip in the morning air and leaves floating to the ground all around. In Norway it is getting chilly, with frost during the night, but the days are beautiful and sunny! It has been unusual warmer this fall in north Alabama. The high temperatures this week has been in the upper 80's and low 90's. Looking forward to the weekend when the cooler fall temperatures are suppose to arrive. It feels like Fall here in CO!! Today's high is supposed to be in the 50's and we actually turned on the heater for a little while last night. It's a little warm for southeast MO. Expecting it to cool off to highs in the 60s by the weekend. Canastota NY...61º and fair right now. Next door in DE. Not much different. Just glad Matthew won't reach us. We just started to have fall-like weather this week although it's warming up again here near San Francisco. My husband and I are flying to Atlanta tomorrow to visit relatives. We planned to visit Savannah and Hilton Head but Hurricane Matthew may make us change our plans. Here in New Zealand, it is spring. Yesterday we had gale winds, I was waiting for tall trees to topple, today we have lots of rain, Cherry blossom is starting to show, bulbs have almost finished (daffs) bluebells in pink and blue are flowering and the grass is growing. This is another very generous give-away, thanks so much for your part in it all. In Florida where we are awaiting the arrival of Matthew. Can't wait for Saturday when all the madness will have past us. I live in south Texas. Although my husband claims a cooling front has come in, it still feels like summer and 90 degrees to me. I miss the Pennsylvania autumns of my childhood. I live in Ohio...close to middle. :) We have had an amazing week of wonderful weather!! Nice..into the 70's..cool 50-60 at night. Rainy & chilly Last week tho...and by this weekend..more normal Autumn temps will be back! Definitely Enjoying!! I live in Dallas, Oregon - about 45 minutes from the coast. It's a rainy week, but I'm ready for it. Nice to have it cool 60-65 degrees. I live on the coast of SC where we're anticipating a hurricane. The weather here in the midwest is perfect fall weather....warm with a little breeze and falling leaves....I am loving it!!!! The calendar says October but it still feels very summery here in NE Texas...93 degrees today. We are having a beautiful fall here in BC, sunny and dry, but there is a little fresh snow on the mountains as a portent of what is to come! What a relief from the 100's. we are experiencing 80's and low 60's at night. NICE!!! I also live in Virginia, and the weather has definitely cooled off this week! Fall is here! I'm in St Paul, MN and today was about 65 degrees but tonight it will be darn chilly maybe 30! Your quilt is beautiful! I'm in Northern California and the last few days we've had a few days in the low 70s. They say we have a few more days of 80s coming this weekend though. I'm so ready for the cooler weather to stay for abit! Adorable patterns! Would love a chance to win! thank you for all you do!! It's beginning to feel like Autumn in my part of Virginia too! Surprisingly, we have had cool temps so far in October and last week of Sept here in NW Alabama. Seems like the cool temps are a bit early this year -- maybe just me. I am sure enjoying the cooler weather. Love to sew when it cools with the windows open. It's perfect sunny and 72 in San Diego. Has been wonderful. We have had a few fall-like days in Alabama but it has been hot this week. I am ready for the cool breezes of fall. Love your blocks! Thanks for the chance to win the patterns. I live in Valencia Spain and here it's hot and 80 degrees...waiting for a change in the weather and hopefully some rain...we are suffering a drought, really tough for the fruit and veggies ! Thanks for the giveaway! It's chilly here in southern VT, but at least the sun is shining for my day off. I have got to bring my houseplants in! It has been warmer than normal here but expecting a week or so of cooler days tomorrow. Also, humidity will be lower, the best part. I live in Vancouver Washington & it's been raining all week! Good for quilting. Thanks for a chance to win. Cool, so many bloggers! 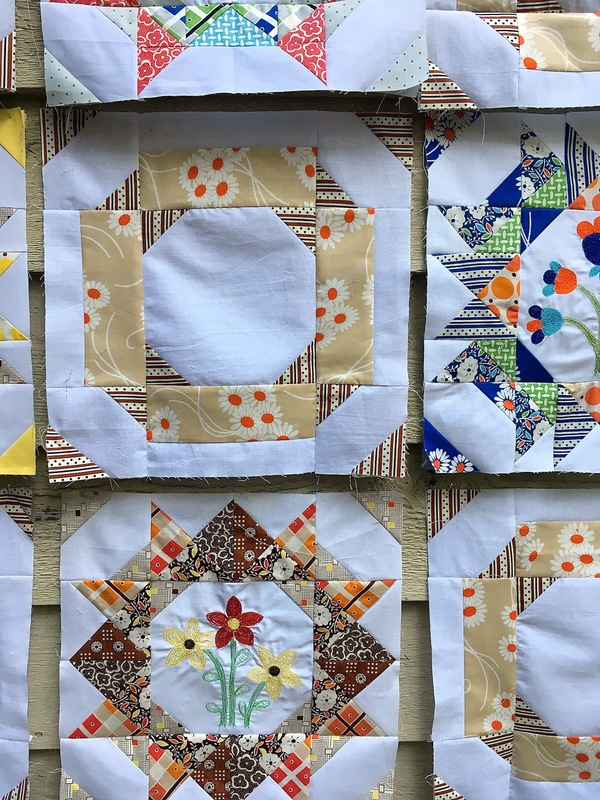 I am a little new to quilting and so much want to be part of the giveaways. 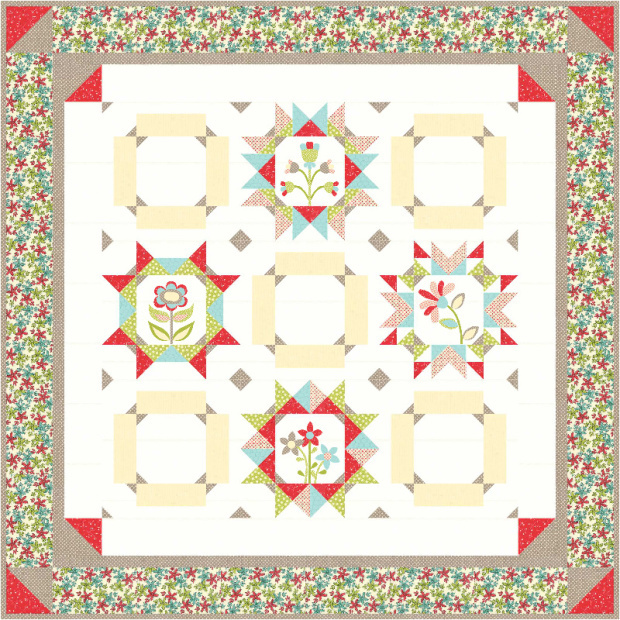 My new husqvarna Epic want to quilt! What wonderful fall days we are having here in Pennsylvania. I'm anxious, though, for my friends and family in Florida. I'm in Texas. Yesterday was 90 degrees and we're supposed to be in the 70s tomorrow. I'm certainly ready for Fall weather! 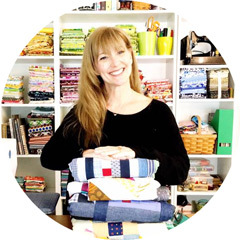 I love the fabrics and colors you're using! weather here in Arkansas has cooled down some but the days are still pretty warm but the night time temps are cooling off. Leave colors are changing some. It's a lovely fall day in central PA! 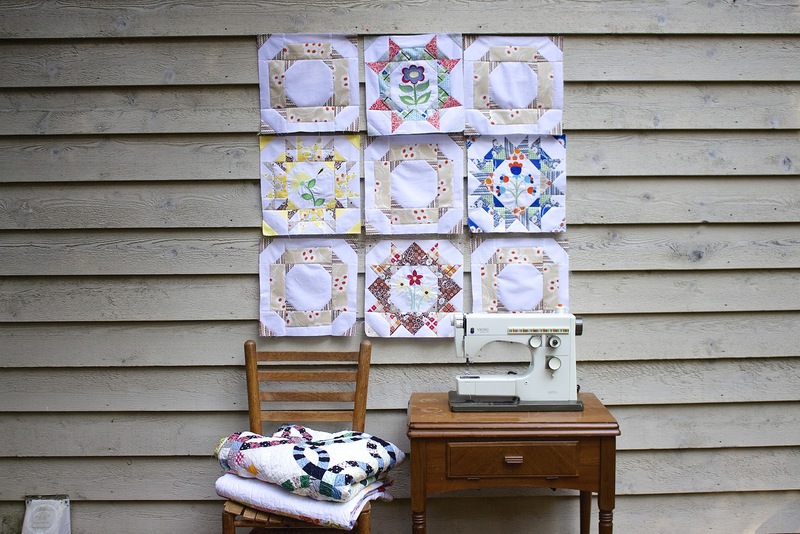 Thank you so much for your beautiful and informative blog - I LOVE QUILTERS! It's getting cold and wet. The perfect weather for a fire and snuggling. It is definitely fall here. We are having some rain and wind and colder temperatures. The weather here is finally sunny. Has been rainy for over a week. Here in Kansas City, autumn is coming! Today we are experiencing thunderstorms with tornado watches. Cold snap starts tomorrow; lows in the low 40's and highs in the low 60's. Just thankful I'm in the middle of the country not in the path of hurricane Matthew. Love how you flower blocks pop on Maggie's first dance! Here in Payson, Az it has been cooling off nicely. But hey what do you expect to happen up in the mountains in the middle of a pine forest? Even in the middle of a mostly desert state. fall is here. I live in Henderson, Nevada, and the weather has been beautiful here! Clear skies, high 70's, and a gentle breeze! Perfect for walking! The weather here is definitely feeling like fall. Colder nights and cooler days and the last couple days have been rainy. I really enjoy the four seasons. Wow, here in northern Arkansas it is just turning chilly. Still have the windows open, but went to long sleeves😁. I'm in Burleson, Tx. which is just south of Ft. Worth. The weather was up to nearly 80 but in low 70's at night.